Robin had already been restless at school and bored by traditional book-learning. After taking a year off during his family’s excursion, those feelings intensified and sailing became an obsession. He yearned to see the world and get away from the regimented society in which he lived. Robin wanted to do something different, special, and totally his own. When Robin dropped out of school and attempted to run away from home, his father said, “I figured if I didn't help him to do it right, he'd do it on his own in a leaky boat.” So Robin’s dad purchased and outfitted a 24-foot sloop, Dove, for his son. Robin’s father had once dreamed of undertaking an around-the-world voyage himself, so he understood how his son felt. Robin’s mother, on the other hand, wasn’t quite so keen on the idea. Single-handed sailing is hard enough, but sailing alone around the world? The goal is simple, and yet it’s a difficult ordeal of at least 21,000 miles and many months. While circumnavigating the globe is one of the oldest challenges of all time, it has cost even some of the most experienced sailors their lives. More adventurers have actually traveled into space than sailed solo around the earth, and only a handful of people have done it under the age of 20. Nevertheless, whether a reckless teen or brave explorer, Robin set sail from San Pedro, California, with two kittens for company. After a successful shakedown cruise to Hawaii, it was September 14, 1965 when he left Honolulu on his solo ocean circumnavigation. Graham’s first landfall was two weeks later at Tabuaeran, also known as Fanning Island or Fanning Atoll. From there he sailed to Western Samoa and Pago Pago. Robin had to stop for a while to repair damage to his boat caused by a sudden squall, and then he stayed in the area to wait out the hurricane season. In the spring of 1966, Robin sailed from Tonga to Fiji while visiting many small islands along the way. Once in Fiji, he met and fell in love with a girl named Patricia Ratterree from Los Angeles who also happened to be traveling around the world. Just like a typical romantic teen, from that moment forward all he could think about was Patti. They kept in touch, and Patti hitched rides on airplanes and steamers to meet Robin at his ports of call. By this time a whole year had gone by. On October 22, 1966, Robin sailed to New Hebrides and then to Guadalcanal in the Solomon Islands. While in the Solomons, Robin visited Florida Island, Savo Island and Tulagi Island. He arrived in New Guinea on March 24, 1967. After leaving New Guinea, Robin landed at Darwin, Australia on May 4. On July 6, Robin sailed toward the Cocos (Keeling) Islands and traveled 1,900 miles in eighteen days. But eighteen hours out of the Cocos, his boat lost its mast during a storm. Under jury-rig, Robin had to sail 2,300 miles to reach Mauritius. After repairs, Robin sailed 1,450 miles to Durban, South Africa. Robin spent nine months in South Africa. He married Patti and they spent their honeymoon at Kruger National Park. Robin’s father had opposed the marriage thinking that it might interfere with the voyage. If it had been up to Robin, the trip would have come to an end way before it did. But Robin was pressured by his father and by National Geographic who had picked up the story – and both of whom were helping finance the trip – to complete the circumnavigation. Nevertheless, Robin’s strongest motivation to sail on was his wife who inspired him to keep going. On July 13, 1968, Robin left Cape Town and headed northward along the west coast of Africa. On August 5, Robin landed at Ascension Island, then he continued across the Atlantic. Later that month, he sailed up the Surinam River and visited Barbados. National Geographic magazine had commissioned Robin to keep a record of his trip with photographs and a journal. Upon arriving in Barbados, his sloop was in such bad condition that Robin used the money from National Geographic to buy another boat in which to complete his circumnavigation. Continuing his trip in the 33-foot Return of Dove on November 20, 1969, Robin reached the San Blas Islands of Panama where he spent two months exploring. After spending Christmas and New Year’s Day at Cristobal in the Canal Zone, Robin sailed through the Panama Canal and finally reached Balboa, California on January 17, 1970. Robin was just a 16-year-old teenager when he left on his voyage around the world. Five years and 33,000 miles later, he was a 21-year-old married man (and expectant father) who had accomplished what few would dare attempt. Alone at sea for as many as 38 days at a stretch, he survived many hardships and obstacles – including the doldrums, loneliness, sleepless nights, stormy seas, two broken masts, circling sharks, and a near collision with a freighter. He also saw innumerable stars, tropical islands, spectacular reefs, and experienced countless adventures in some of the most beautiful places on earth. Along the way, Robin learned about many different cultures and customs by personally visiting places that were rarely seen and virtually unknown at the time. More amazingly, Robin did this without a 2-way radio, GPS, Internet, or even a life raft, in a boat barely bigger than a bedroom. All he had was a sextant, charts, and a chronograph. A navigation error of only half a degree would have left him miles from his destination, yet he did the navigation without giving it a second thought. Robin even invented a simple auto pilot for the boat. Robin was a courageous, honest young man with a lofty ambition that did not include seeking fame and fortune for himself. Just like his circumnavigating predecessors Joshua Slocum and Harry Pidgeon, Robin Graham simply took an ordinary boat with minimal resources and set out on an excellent adventure. Refreshingly, at that time there was none of the extreme hype that surrounds similar ventures nowadays. Robin and Patti, both with down-to-earth values, didn’t care about material wealth; all they wanted was the freedom to “do their thing.” This is in sharp contrast to many people who are primarily concerned with money and social status. Robin probably inspired more people to leave the mundane land-life and travel the oceans than any other person this century or the last. Yet ironically when he arrived back home, “I had no desire to be around the ocean,” Robin recalled with a laugh. Robin and his wife briefly attended Stanford University but after having roamed the world, found that they had acquired a maturity of attitude which did not fit in with the liberal college atmosphere. Wishing once again to get away from civilization, they decided to settle on a rugged timbered homestead near Kalispell, Montana, where the nearest neighbors were three miles away. “With a mail order course, they planned to help educate their daughter, Quimby, and themselves, and meanwhile they would build a new and simple life style based on understanding and enjoying the natural world.” [Holm, chapter 34.] National Geographic did one last interview with Robin and Patti at their home. Graham’s book about his voyage, Dove, was published in 1972. It is to Robin’s credit that this book has been in print for nearly 40 years and is among those recommended on homeschool reading lists for young adults. Robin’s voyage was also depicted in a film called “The Dove.” Another book, Home is the Sailor, was published in 1983 as a sequel to Dove. Now hard to find, it continued the story of Robin and Patti's life in Montana, sharing their trials and triumphs as they followed the Lord and learned to live off the land. The Grahams inspire sailors and landlubbers alike with their wonderful story of courage, perseverance, and hope. Robin and Patti are still married and living in the log home that they built for themselves, framed in the shape of a cross. They have two grown children, Quimby and Ben. Quimby is married to a doctor and lives in Michigan with two sons. Ben lives in Montana and is married with a little girl. Robin is in the construction business. He and Patti are both actively involved in Christian service projects. Seeking to positively influence the lives of people around the world, they do volunteer work for international aid organizations and frequently fly overseas for that purpose. If you go to Google Images and search for “robin patti graham” you will find a photo, circa 1995, of a grey-bearded but smiling Robin Lee Graham, and beside him Patti – who, despite being middle-aged, retains the blonde good looks that attracted Robin to her when they met in Figi about 30 years before. Their story of adventure and romance is a classic and it’s great to know that he and Patti managed to live happily ever after! 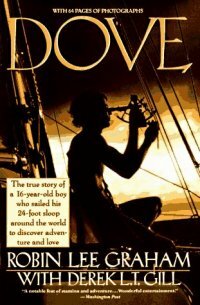 Dove , by Robin Lee Graham - The autobiographical account of Robin Lee Graham's record-breaking voyage. It reads like a personal travelogue, in which he grows from a boy to a man and finds himself, as well as the love of his life. The narrative is conversational in tone and unsparingly honest, revealing both his insecurities and resourcefulness, while hitting all the marks for teen appeal and emotion. Young adults will be heartened by Robin's example which shows that even an ordinary kid can follow his dream. The Boy Who Sailed Around the World Alone , by Robin Lee Graham (A 1973 Golden Book) – A children’s book in which Robin Lee Graham recounts his record setting adventures around the world. Home Is the Sailor , by Robin Lee Graham - A follow-up to Dove for those who want to know what happened to Robin and his family after the voyage around the world.